Pavers are concrete forms that come in a variety of shapes and sizes that are fitted together as a surface for driveways, patios and other areas around homes. They are often interwoven in intricate patterns that create a uniform, finished look for the surface. Unfortunately, the airborne seeds of common weeds may find their way into the cracks between these interlocking forms, giving the patio an untidy appearance. There are a number of ways to eliminate the weed growth, which can be an ongoing problem for homeowners. Remove larger weeds manually. Grasp the weed as close to the base as you can and try to pull out the root with it. This is not always successful, and it is not uncommon to leave enough root behind for the weed to grow back. According to Aspen-Bend.com, a special long-handled paver-weeding tool is available to help dig out the root from between the pavers. You can also lift up the patio paver to remove the entire root to keep it from regrowing. Pour boiling hot water on the weeds. Boiling water is an inexpensive and convenient way to eliminate the weeds, according to PlanetGreenDiscover.com. This method kills the weeds in a few days and has no toxic effect. It will not stain or damage the patio pavers. Vinegar can also be poured on the weeds, which will then turn brown and die in a day or two. Vinegar can be used without harming the environment. Spray on a chemical herbicide for stubborn weeds. 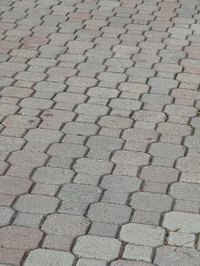 The Paversbydesign.com site recommends products such as Roundup or Amdro to eliminate weeds between pavers without damaging the forms. These are mild herbicides that should be used according to package directions to limit the environmental effect. Flame the weeds with a propane torch. Though it may seem like a drastic way to get rid of weeds, flaming them makes the cell tissues swell up and explode, eliminating them down to the root. You should use this method only if you are familiar with the propane equipment. Take care to follow all safety procedures to keep from igniting other materials around the patio. How Can I Remove Stains From Paver Bricks?